Ever since my first visit, I’ve been curious to get back over to Yono’s to experience one of Albany’s finer restaurants in a bit more depth. 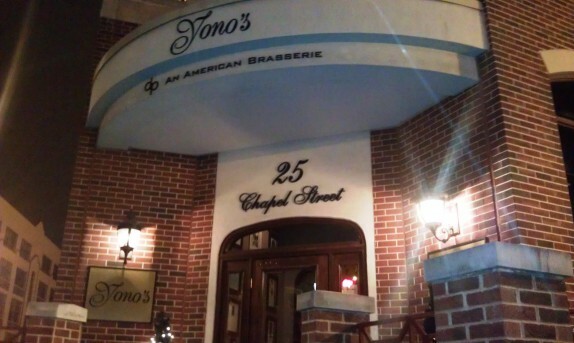 As I brainstormed ideas for a bachelor party dinner, Yono’s, which recently was nominated for a James Beard Award for its outstanding wine program, became more and more of an obvious choice, especially since it is attached to a hotel. A tasting dinner with wine pairing would be a fine way to celebrate with five of the closest guys in my life; that was the thought. I sat down one evening with proprietor, Dominick Purnomo, and he went over a few options with me. One option was a four course seasonal tasting dinner for $55 per person with $29 for tailored wines with each course. 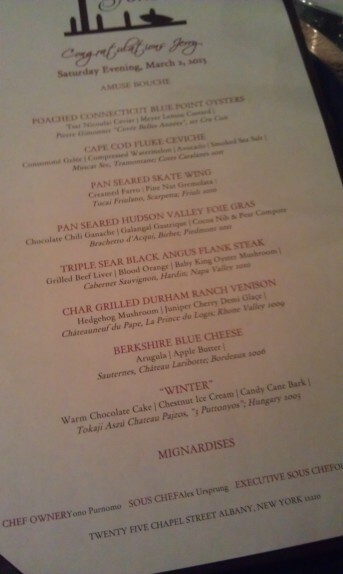 A second option was the chef’s tasting menu for $89 with $59 for tailored wines for each course. With the second option, the menu is created almost daily based on what ingredients are freshly available. It was pretty much a no-brainer that I chose the second option for the occasion. Explaining to my invitees that I didn’t know what was going to be served was a little tough because a few of the guys are picky eaters, but I was confident that it wouldn’t become an issue for the staff in case special requests were made. Most of us arrived a few minutes early for our 7:30pm reservation and were greeted at the dP hostess station by Donna Purnomo, who was busy answering phones and seating other guests. We would have been fine waiting for our last guest at the dP bar, but Donna offered to seat us at our table, since it was available. Inside Yono’s, it is fancy but not pretentious. The colors in the room are soft and vibrant. The tables are set with some silverware and flatware, but not nearly enough for the entire meal. A friendly young man greeted our table and handed us menus. The menus were custom printed to include the date, “Congratulations, Jerry” and the descriptions of the courses; I kept one as a memento. Once our whole party arrived, the same young man came to talk to us about special dietary restrictions. Three of my guests did not like seafood or weren’t keen on raw seafood dishes. The staff said this wasn’t a problem and that they would substitute something for those guys for the seafood courses. When they asked what these guys liked, I interjected with an inside joke response, “pizza, buffalo wings, hot dogs…” and it was at that point that the staff realized that we weren’t the usual fine dining patrons (well, they probably also realized it when a staff member had to come over to ask one of us to remove a ball cap, but, in his defense, he dressed up the ball cap.). The young man brought over a tray with freshly baked breads; I think that tray circulated the table at least four times. It was enough times that different breads were on it by the last trip around the table. The freshly baked pretzels were a huge hit among the guys. An amuse bouche, smoked salmon mousse with nori chip, arrived, and the dinner was under way. The amuse was a great way to waken the palate, and even the guy who didn’t like seafood raved about how rich and delicious it was. 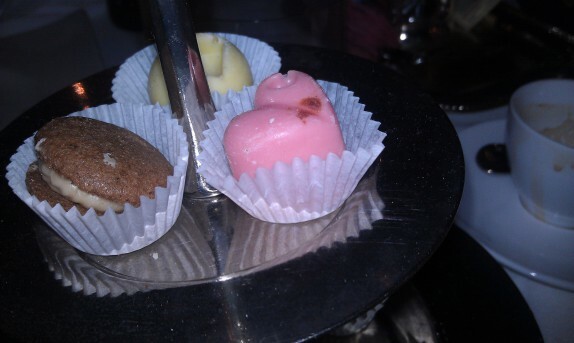 While this course was small, the flavors were very bold. The Meyer lemon custard was sweet and just sour enough to cut through the smoky flavor of the oyster. 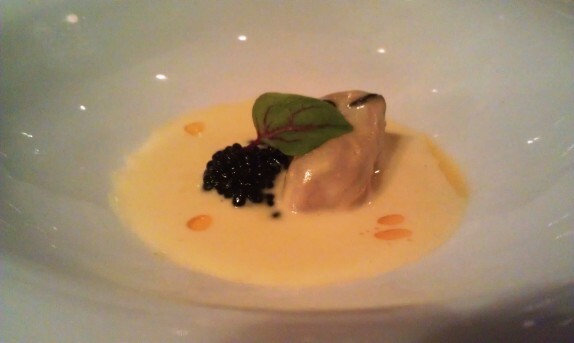 The caviar was rich and creamy and held up against the custard and the oyster. The oyster itself was soft. The champagne didn’t compete with any of the flavors, and the effervescence enhanced the sweet flavor of the Meyer lemon. The flavors in this course were a bit more delicate. The richest part of the bites were the avocado. The fluke was flaky but light. 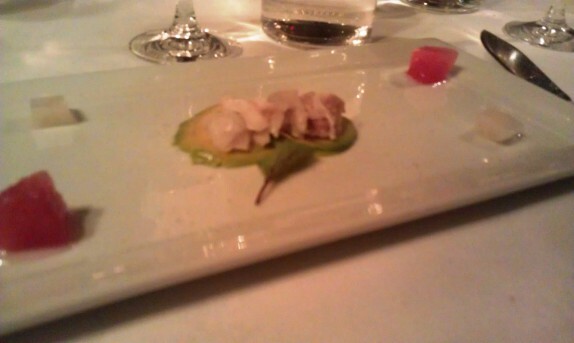 The gelée and the watermelon accented the freshness of everything. The wine was very interesting. It was very fragrant with peaches and apricots coming strong off the nose, but it was light and had just a little body. This was another great pairing, as the wine really accented the flavors in the dish. We all got a great laugh at this dish. The staff listened to my stupid joke and delivered a dish that was a huge success among the people who don’t enjoy seafood. 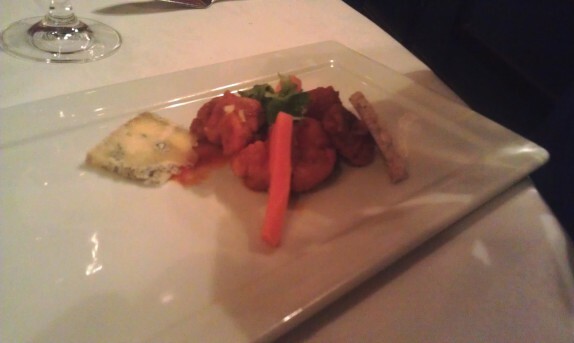 I tried one of the larger chunks of sweet breads, and, although it was a little chewy, it tasted great. I’m sure you can toss anything in Buffalo sauce and it’ll be good. This dish was the highlight of the meal for me. 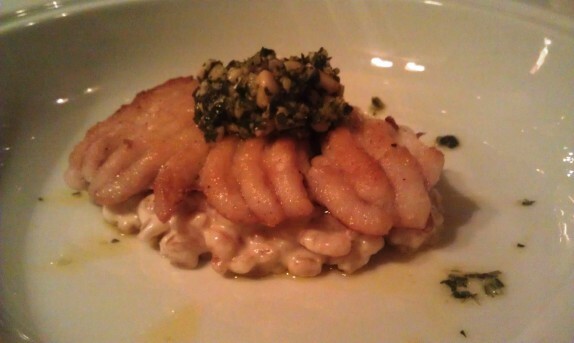 The skate was cooked absolutely beautifully and took minimal chewing to dissipate. Along with the creamy farro, which was also cooked perfectly, and the fresh vibrant pine nut gremolata, this was a perfect bite. I am going to say this is the best dish I have tasted in the Capital Region. 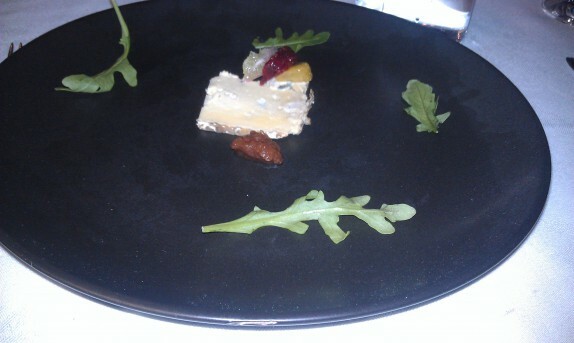 I was so enthralled by the flavors and textures in this dish that the wine wasn’t particularly remarkable. As a substitute course to this, the non-seafoodies got a bitter green salad with R&G Chevre. I don’t think the guys were ready for how bitter the greens were, and it was fun to look around the table and see their puckered faces. Dominick came over to the table with two servers carrying dishes; they all had wide grins on their faces. 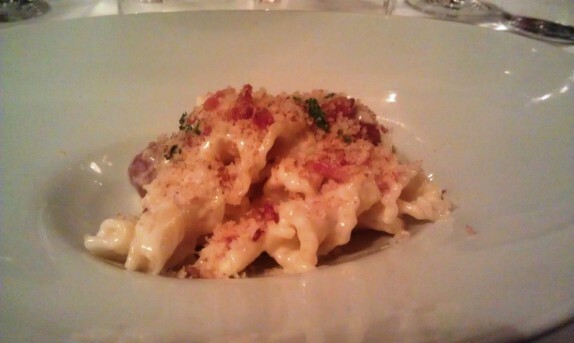 As Dominick described, the chef wanted to make sure everyone had something they liked, so he whipped up some mac and cheese, threw in some wagyu beef hot dogs and topped it with bacon. All of us loved the sentiment and really loved the dish. Campanelle is a fun cut to use for mac and cheese because the cheese can mingle through the folds of the pasta. I think this was the course that made the evening unforgettable for most of the guys. 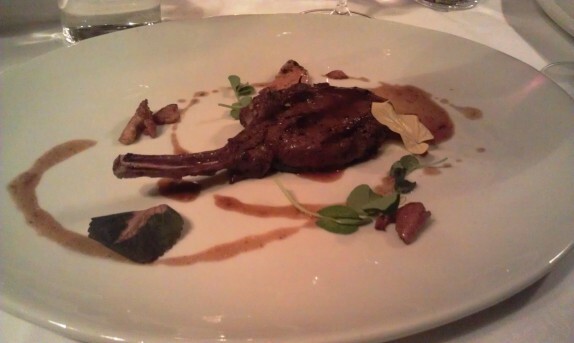 They loved how this seemingly strict fine dining restaurant was able to impress schlubs like us. This dish was presented in a fun way. 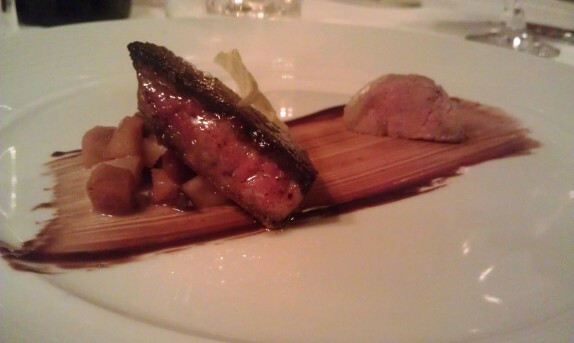 The foie gras was prepared as a duo; one preparation was a cold sausage and the other was a deeply browned cooked preparation. I much more preferred the warm preparation, but it was served slightly cool to my liking. The sauce and accompaniments were rich and bold enough to stand up to the foie, and the richness of the foie was a perfect delivery device for all of these bold flavors. The wine went very well with this course, as it was relatively light bodied for a red and was moderate on the bitter tannins. This dish confused most of the guys at the table, as they first bit into the beef liver and made the judgement that they didn’t like the steak. 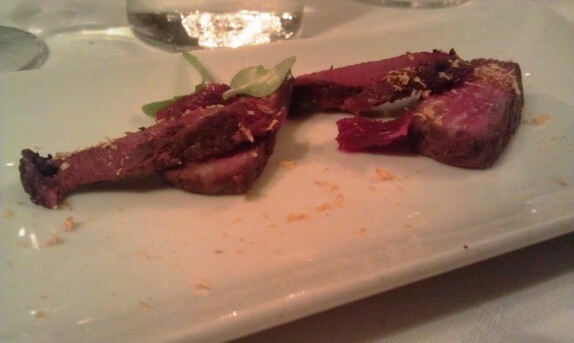 The liver was served atop the steak, so, once they actually took a bite of the steak, they were more on board. I didn’t think this was a particularly strong dish, but it wasn’t bad by any means. I think you really need to be a fan of liver to fully appreciate this one, and none of us really are. The wine was pretty good. I’m not a huge fan of Cabernet Sauvignon, but this one tasted good. This was more or less the main course. 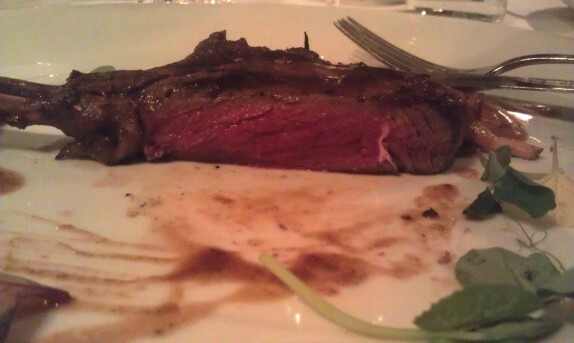 Given the sizes of the other courses, this one definitely stood out, as it had the most protein on the plate. The venison loin chop was cooked rare with a nice sear and perfect seasoning. It was a little gamey, but it wasn’t overpowering at all. The demi was a little sweet and helped to mask the gameyness. The wine with this course was full bodied and a little spicy. 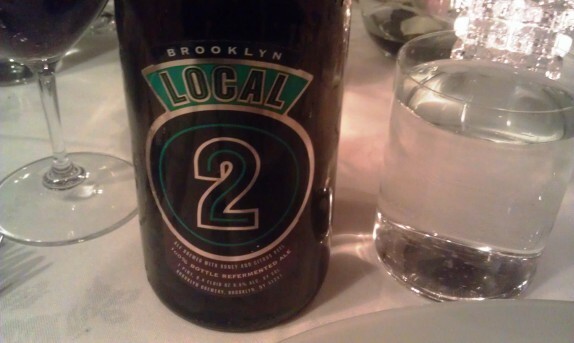 Again, it was a perfect selection to pair with the course. I’m a huge fan of cheese courses before dessert (or as dessert), especially with wine. The wine chosen for this course was nice and sweet. The cheese was strong and creamy, and the wine was great to swish away the cheese. Both worked very nicely together. Ohh man. 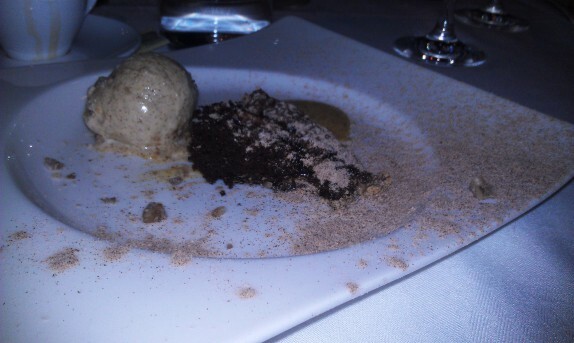 Topping off the meal with a rich chocolate cake with chestnut ice cream was insane. The cinnamon sugar around the dish put it over the top, as the spice warmed the taste even more. The wine was strong and sweet, but, by this point, a lot of the subtitles were lost on me. 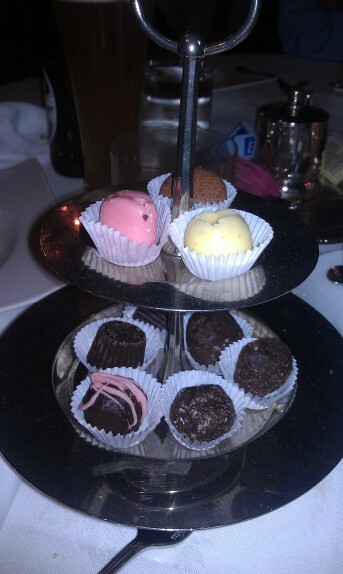 At the end of the meal, they brought us a tower of petit four. I got one that was chocolaty and delicious. And I had an espresso. 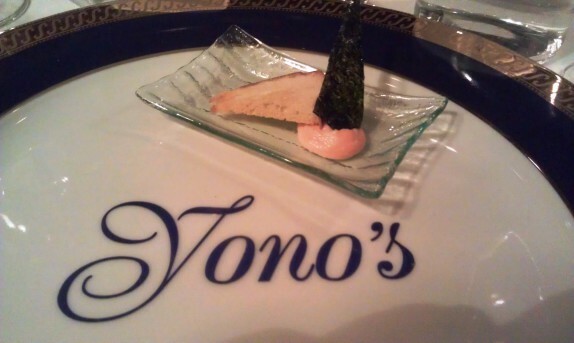 While the meal was memorable, delicious, and almost flawless, where Yono’s excelled that evening was in service. The staff was attentive to our table, and provided plenty of privacy for our party to mingle and enjoy each others company. As the courses were delivered to the table, someone came over to describe the dish, and, likewise, as wines were poured, the staff members named the wine and vintage and also gave a brief description of things to look for in drinking the wine. When engaged in conversation, the staff was amicable. Throughout the course of the meal, we learned that one of the waitstaff had worked at a restaurant in Queens very close to where my friend lives and that another also works at one of my favorite brunch spots in Troy. The bottom line is that the staff maintained a highly professional demeanor and delivered a high quality experience without the formality that sometimes comes with fine dining. I was glad that I chose Yono’s for this. Actually, when I first emailed Dominick to arrange a time to meet, his response included “I look forward to working with you to create this exquisite event.” At the time, I giggled a bit at the idea of a bachelor party being described as “exquisite,” but, after all was said and done, the experience was indeed exquisite and highly memorable. How sweet! I love the mac and cheese and buffalo sweetbreads. That’s awesome. We really need a reason to eat there soon. I knew I was stepping out of my comfort zone when I decided to go to this dinner, and it was totally worth it. I, along with John, had some reservations about what we were going to wind up with for food, and joked about hitting up Five Guys afterward, but we didn’t need to. For picky scumbags like us in a fancy restaurant, they went out of their way to make us feel welcome, and show us that we were appreciated. The staff was so great, joshing around all night, and dealing with some of our running jokes. We’re not a serious, frumpy group, and they fit right in with our sarcastic barbs at one another, and even made a few themselves. Hell, I wound up with fresh brewed, unsweetened iced tea all night. That goes a long way to keeping me happy. Yeah, so I had to take my hat off, it’s not as big of a deal as I make it out to be (it’s my longest running schtick, starting in the second grade when mean old Mrs. Mar made me take it off every morning), it gave us all a good laugh for the night. Besides, at least I was in slacks. Cough, cough, guys wearing jeans, yeah I’m looking at you. Solid food, great company, amazing night. Wow – that really sounds like an amazing night! What a terrific staff, I’m so impressed. The hot dogs and mac & cheese course is hilarious and so awesome – I think it really speaks to the quality of the restaurant. It shows there’s good communication between the wait staff and the chef, it shows that they care about your special night from a hospitality perspective, and best of all, it shows that the chef truly loves his food and knows how to make it an experience. 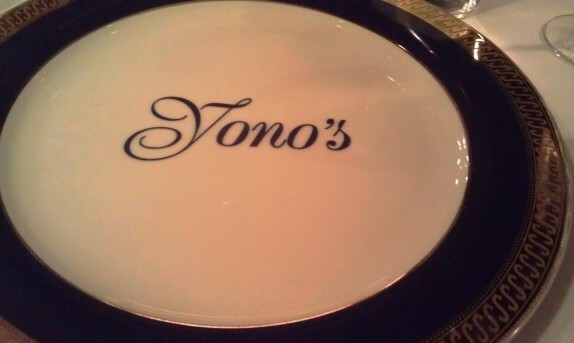 I *still* haven’t been to Yono’s and I really need to go soon. Sounds like a fun evening. We’ve got to get back there someday soon.